Try to imagine yourself living in a tent for months, away from your home, with no idea when you will have more stable accommodation. You feel insecure, have no income, and the tropical wet season has arrived. This is what the majority of people from Ambae in Vanuatu are currently living with after they were forced to relocate in August when the government declared a state of emergency and mandatory evacuation due to a surge in volcanic activity causing ash fall and acid rain. Leaving everything behind was heartbreaking for the 10,000 evacuated residents. 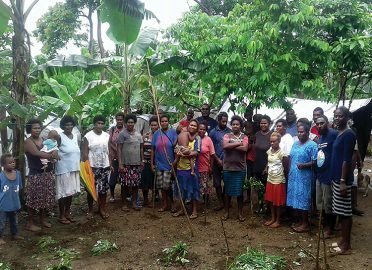 Since we reported on the situation in our last Abundance and in our Spring Appeal, we have continued to work with impacted communities through our partner, the Anglican Church of Melanesia (ACOM), and through the Church Agencies Network Disaster Operations (CAN DO) consortium. From the onset, reliable access to food and water was addressed and remains crucial to enabling people to resettle and recover. Through training and allocation of seeds and tools, more than 3,000 evacuees have been given the ability to grow their own vegetables to eat or sell. In any emergency, the most vulnerable are women and children. So, a core focus of our work has been to ensure that women and children are protected during this upheaval. Dignity kits were also distributed to women, which made them more comfortable and provided an opportunity for conversations on a range of other issues including gender-based violence. Communities were educated around child protection risks and protections put in place. Despite the lifting of the state of emergency at the end of November, the Vanuatu government has recommended Ambaens concentrate their efforts on building lives in their new island homes. This means working with local communities in resettlement areas through church leaders, families and women’s groups to provide a sense of dignity, stability and social cohesion for everyone. Psychological first aid is also made available to those struggling with the trauma of the changes. The Ambae, Vanuatu Volcano Appeal is still open. If you would like to donate click here. 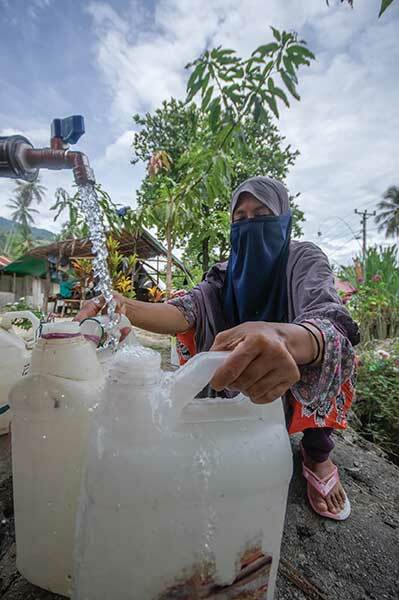 In September last year, the people of Sulawesi, Indonesia were hit by a tsunami as a result of a 7.5 magnitude earthquake. Then, on December 22, another tsunami hit the coastline of West Java and Sumatra, caused by an underwater landslide triggered by the eruption of Anak Krakatau in the Sunda Strait. Both these incidents brought up memories of the pain and devastation of the Boxing Day tsunami 14 years earlier. The first tsunami in September caused incredible devastation. Waves as high as six metres hit the coastline, leaving vast damage and more than 2,000 dead. As a result, we launched an appeal to help aid and recovery efforts through the global ACT Alliance. Our response has included sending more than $25,000 to our ACT Alliance partners, Peleski, YEU, and Church World Service. The hardest hit areas have been the districts of Palu, Donggala and Sigi, with more than 100,000 people affected, including children, pregnant and nursing women, the elderly, and people living with disabilities. On top of that, the earthquake and tsunami effectively cut off much of Palu and Donggala from the outside world for several days, with electricity and telecommunications cut, and supply routes damaged. Debris and landslides also blocked sections of main roads, and whole villages were submerged when the land they were built upon liquefied. The destruction was almost unprecedented. When emergencies like this happen, recovery takes place in two stages. The first response is to make sure immediate and basic needs of shelter, food and clean water are met. The next stage of recovery looks at the longer-term; supporting the communities in their rebuilding, rehabilitation and helping them earn a livelihood again. This work continues for years post-disaster. It might be difficult for many of us to imagine the devastation of suddenly losing everything you own. Disasters like this affect every part of existence. More than the physical loss is often the psychological distress that lasts for many years afterwards. The wave of devastation that hit Sulawesi in September has been met by a wave of compassion and determination in the recovery efforts in the months since. As always, your support has been wonderfully generous and we are enormously grateful. The Indonesia Tsunamis Appeal is still open. If you would like to donate click here.